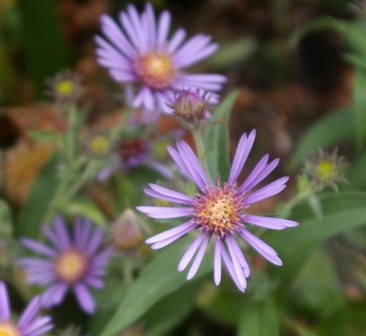 Joy Creek Photo Archive (c) all rights reserved This running aster naturalizes well in difficult dry or cold sites, even in clay-based soils. The simple ray-flowers of Aster modestus continue throughout the summer contrasting nicely with the dark green, lance-shaped leaves. Generally found along the Canadian border west of the Great Lakes. June to August. 1 ft. x spreading.